Life. Death. Devastation. Survival. In three days, Chengannur in Kerala has seen it all. A first-person account by TNIE reporter Anuja Susan Varghese. These are days of horror and heartache for the residents of Chengannur. Three days of life, death, devastation and the battle for survival. The mayhem the floods unleashed on our town is unprecedented. When a rescue boat of the Fire and Rescue Services arrived at Parambathoorpady, an elderly couple was struggling to stay afloat on the first floor of their house. They were standing in neck-deep water, struggling to breathe. They shouted and banged on the doors to attract the attention of the rescue workers, before they were rescued. Independence Day being a holiday, I returned home to Piralassery, around 2 km from Chengannur town, on August 14. I was supposed to return to Kochi on Thursday morning, but it rained heavily on August 15 and the entire area was marooned. On 16th evening, the floodwater had reached 100 m from my house and most people didn’t get the time to shift. The shops at Puthenkavu Junction, merely half-a-kilometre from our house, lay submerged and the flow was so heavy that it was difficult for country boats to reach the area. 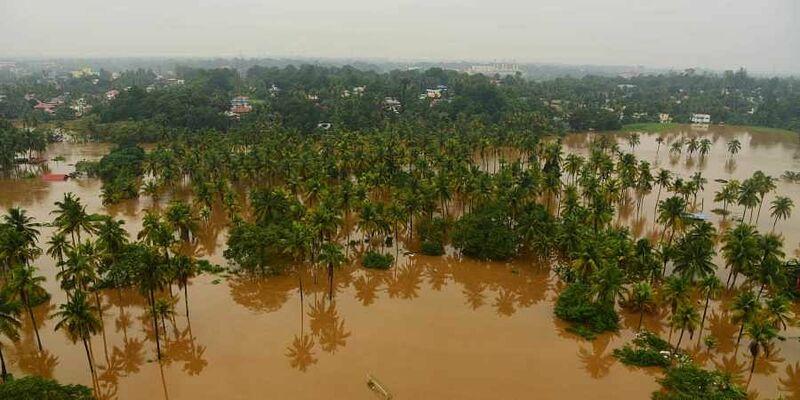 Places like Arattupuzha, Neervilakom, Angadickal, Malakkara, Aikattu on the southern side of river Pampa were inundated, with the ground floors of most houses submerged by evening. Neervilakom, a low-lying area, bore the brunt of the flood, with the water rising to the roof of two storey houses. A 50-member team from the Indo-Tibetan Border Police (ITBP) arrived in Chengannur on August 16 morning. They had two fibre boats and a speedboat with them which they pressed into the rescue mission immediately. The Fire and Rescue Services personnel and the police also joined the rescue operation. Georgy Varghese, an agricultural officer, and his wife Bindu were staying in a two-storeyed tiled house at Malakkara. As the water entered the first floor of the house, they shifted to the wooden ceiling of their house. They removed the tiles of the roof and sat on the wooden ceiling for three days waiting for help to arrive. Trees swept away by the running water crashed against the house and the compound wall collapsed. The nights were particularly frightening. Each sound was deafening and the wait for dawn looked unending. On Friday, as the water inched closer to the ceiling, the rescue workers arrived. Shifted to safety, Georgy still shivers at the recollection. There is no news of his 86-year-old father Baby, his mother and brother who stayed just two houses away. Elsa Mariyam, a Malakkara resident who was rescued by the NDRF team on Friday, said she kept her daughter’s 40-day-old child on the ceiling of the toilet as water entered the first floor of the house. There were snakes and centipedes in the water and the family kept awake all through the night to escape from the reptiles. A 50-member team from the ITBP arrived in Chengannur on August 16 morning. They had two fibre boats and a speedboat with them which they pressed into the rescue mission. Chengannur has a sizeable population of the elderly staying alone, with their children having migrated seeking greener pastures. Omana, a wheelchair-bound resident of Arattupuzha with a servant to take care of her, is ‘missing’ and her relatives in America have been contacting rescue workers frantically to know her whereabouts. An officer with the Fire and Rescue Department said they have been inundated with similar calls from countries like Canada, the USA, the UK and from West Asia. The power lines in the area were switched off on August 15 and there was no way to contact the flood victims as the mobile phones were drained of power. The BSNL land lines that stopped working on Thursday were revived on Friday evening which came as a big relief. A team from the NDRF also arrived and they rescued around 1,000 people by August 16 evening. Though it we was difficult to reach internal areas like Edanadu, Malekkara and Arattupuzha, the rescue workers saved around 1,000 people on Thursday. By Friday morning, two-storey houses at Edanad and Arattupuzha also lay submerged. Power was switched off on the 15th evening. It was pitch dark, with no potable water or phone connectivity. Some NGOs and local people were distributing food packets in fishing boats. On Friday, the Navy started air-dropping food packets to the stranded. Two youngsters, Binu and Ajeesh, who went to Neervilakom for rescue work went missing on Thursday and their bodies were recovered on Saturday. According to the rescue workers, three bodies were recovered from the houses in the area after water started receding. But with the met department predicting more rains, it looks like the travails of the people have just begun.